Tim Lowe speaks at the Simpsonville, South Carolina, store opening. Lowes Foods began in 1954 as a single store in North Wilkesboro, North Carolina, and, over those 63 years, has grown into a nearly 100-store chain operating in North Carolina, South Carolina and Virginia. Now based in Winston-Salem, the grocer grew rapidly during the 1960s, ’70s and early ’80s. By 1984, Merchants Distributors Inc. (MDI) had acquired Lowes, and in 1986 an aggressive expansion program kicked off, with 19 stores opening over the next four years. In 1997, Lowes Foods increased its store count with the purchase of Byrds Food Stores in eastern North Carolina, followed in 2000 by the purchase of 13 Hannaford stores. Today, Lowes Foods continues to open new stores in North Carolina and South Carolina, which are hotbeds of grocery competition. The chain has always prided itself on finding out what its shoppers want and delivering on it. “Stores, products and services are continually updated to meet the changing needs of customers,” the company says. For instance, in the 1990s, Lowes Foods introduced FreshSmart stores, with an emphasis on customer service and fresh produce, meat, seafood, deli and bakery items. And in 2013, Lowes embarked on in-depth consumer research in addition to holding a series of overnight workshops for not only its store managers but also managers from MDI and Alex Lee, Lowes Foods’ parent company. 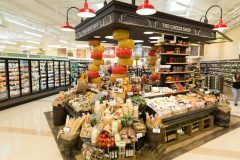 In January 2014, Lowes Foods reopened the first store to offer all of the newly developed concepts in Clemmons, North Carolina. The chain continues to develop new concepts to help further differentiate its stores. 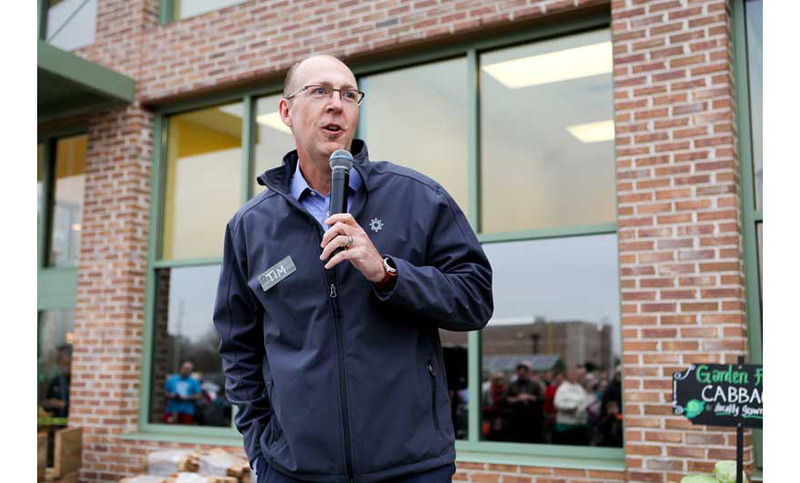 Tim Lowe was named president of Lowes Foods in June 2013. Before that, he served in several roles with Supervalu, including SVP, president of Shoppers Food and Pharmacy, SVP of merchandising and EVP of merchandising. He started his career in retail in 1992 as a regional manager for Walmart, followed by VP of general merchandise for Meijer Inc., district manager for Best Buy and regional VP for Circuit City. He earned a bachelor’s of science degree in pharmacy from the University of Houston in 1991. Below are Tim Lowe’s responses to some questions about his company, named The Shelby Report’s 2017 Southeast Retailer of the Year for its long history and commitment to customer service as well as its determination in innovation. With the increasing levels of competition in the grocery business from competitors like Lidl as well as online grocers like Amazon/Whole Foods Market, what are some of the ways Lowes Foods works to set itself apart and keep customers happy and returning? Knowing that the level of competition would continue to increase, in 2013 we embarked on a brand transformation journey to develop a shopping experience that truly differentiates Lowes Foods from the typical supermarket. We started by doing extensive research in the homes of consumers around our stores. We determined that we needed to create an experience that makes our stores a place where our guests want to spend time. We developed a series of concepts called our “Originals” that all offer an element of prepared foods. We have also developed a differentiated private brand offering with a focus on cleaner ingredients. You have closed stores over the years, as many companies do for profitability reasons; what are some of the lessons learned from these difficult decisions? In other words, how have those closings helped you when opening new stores? Any time we exit a store it occurs within a strategic real estate and long-term company strategy. While these decisions are difficult, it is our goal to always learn from what our guests are asking from us to ensure we can deliver to them a shopping experience that is truly differentiated. With our redeveloped brand, we have been able to identify the size of store, volume of market and resonance of the concepts by market, which allows us to tailor our approach by location. Often, decisions to close a store are correlated with shifts in the community’s “power-centers” and areas of major draw within the local area. Speaking of new stores, what are some of the most important things Lowes keeps in mind as new stores are planned today? The first thing we keep in mind is our Guest. They are at the center of everything we do. That’s why we take the opportunity to go to the community and do ethnographic visits so we can deliver what they are looking for. We also view our entry into new stores as an expansion of our family, therefore, we want to represent the local community in the best way possible. To help with this, we have local vendor fairs prior to opening in the market. This allows us to identify local vendors that we can partner with to sell their products in our stores. We also think of our stores as a village of different shops. 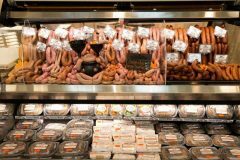 Our stores include a variety of our Originals: The Chicken Kitchen, The Cakery, Smokehouse, SausageWorks, Sammy’s Sandwich Shop, Boxcar Coffee, The Beer Den, Pick & Prep, Breadcrumb, Spice Bazaar, The Cheese Shop and Sunmill Wines. Each one has its own unique character, and this variety helps create the energy in our stores. Finding and retaining good employees is key for all kinds of businesses, not just supermarkets. 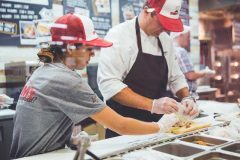 How does Lowes Foods go about finding and keeping good, service-oriented employees, at all levels of the company? Our hosts are the center point of what makes our experience so different. Our Host Experience team comes to the market well before we open so that we can work with the local community to identify the best hosts to deliver the best experience. 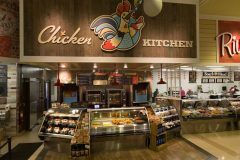 In new markets, we will even identify specific hiring centers where we will set up training environments for our concepts as well as for guest experience touchpoints, such as our deli and front porch (front end). This allows us to audition and vet future host candidates and then train them to our purpose and priorities at Lowes Foods. What are some things you think you could do better? There is always room for improvement in any store or brand. We continue to look to develop new concepts that will keep us ahead of our competition and deliver a differentiated experience to our guests. Our goal is to always keep our eye on our consumer rather than just the competition. By doing so, it will allow us to be an innovative and forward thinking organization that will deliver continued uniqueness. Do you see Lowes continuing to grow into new markets with brick-and-mortar stores for the foreseeable future? If so, any particular areas? The ever-changing landscape of retail is one that we all wish we had a crystal ball to see what is ahead. The things we believe to be true are that there will be continued evolution to online shopping and prepared foods. This will influence how we look at the future. 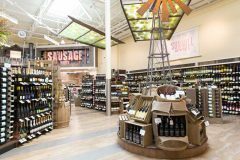 Our store designs will continue to evolve to accommodate these guest behavior changes, but we do believe the visit to the local grocery store will still be a part of a shopper’s behavior. So, our future growth will be through a combination of new stores in new markets and e-commerce. What has been the customer response at new stores you’ve opened in new markets in South Carolina? We’ve been welcomed into the South Carolina community by local vendors, leaders and neighbors. Prior to entering each South Carolina market, we held a local vendor fair to invite local producers to share their products with us. We even made an effort to meet our new neighbors by delivering special gift boxes directly to their homes. The local folks have been very receptive, and we are excited to be part of the community with them. You have partnered with Shipt and Instacart to deliver groceries from your stores in some markets. Do you think home grocery delivery is here to stay, as online shopping becomes more and more natural for consumers? Yes, the growth of e-commerce delivery to the home is becoming an expectation, not a special service. Understanding how to do this efficiently will be important in the future. I assume you agree with us that Lowes Foods is a good pick for Southeast Retailer of the Year. With your view from the top there, what are some of the reasons Lowes stands out? The biggest reason that we believe Lowes Foods stands out is because of our people. Our host teams make all the difference. We can put together differentiated concepts and build great guest environments, but without our people these things would mean nothing. We are honored to be selected, but the real recipients of this award are the store hosts. What role does community involvement play at Lowes Foods? We actually describe our purpose as “We grow Community.” The heart of our store is our Community Table. It is a place where we can celebrate our local growers and producers, and share their stories. We believe our role is twofold: creating a stronger local economy through good partnerships with local suppliers and supporting those in need around us. We lead the Carolinas’ largest food drive, Friends Feeding Friends; we host local vendor fairs to help entrepreneurs gain greater distribution of their products; and we work with more than 200 local farmers. For us, local is not just a word, it is a way of life. We are one of the few locally owned grocery companies left right here in the Carolinas…for us local means family. Lowes Foods is part of the Alex Lee family of companies. Alex Lee grew out of Merchants Produce Co., which was founded in 1931 by Alex and Lee George. Alex George, the entrepreneur, knew everyone’s name and directed the warehouse operations. Lee George, the negotiator, was adept at procurement and sales, but was best known for his kindness. “Their integrity, honesty, fairness and loyalty earned them wide trust and great respect among both customers and employees. Alex and Lee believed in customer service and guided the company through good and bad times by focusing on how they could best serve the customer,” the company says. Lowes Foods and MDI—Lowes’ distributor—says they continue to be driven by doing what’s right for the customer. 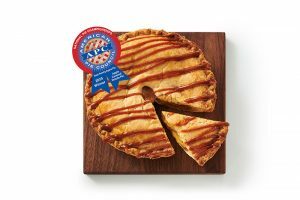 “Today’s team of hosts at Lowes Foods takes great pride in creating services that make life easier for our guests and distinguish us from our competitors,” the company says. A windmill marks the Sunmill Wines display. The Chicken Kitchen offers rotisserie chicken, fried chicken, sides, desserts and more. 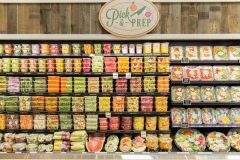 The colorful Pick & Prep section, designed to help shoppers make meals at home faster. 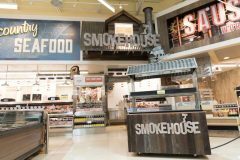 Smokehouse meats are merchandised in the aisle to draw shoppers. 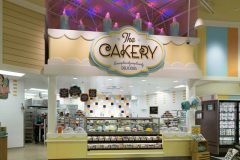 The colorful Cakery, with candles on top that can be seen from across the store. Fresh sandwiches are made at Sammy’s Sandwich Shop.